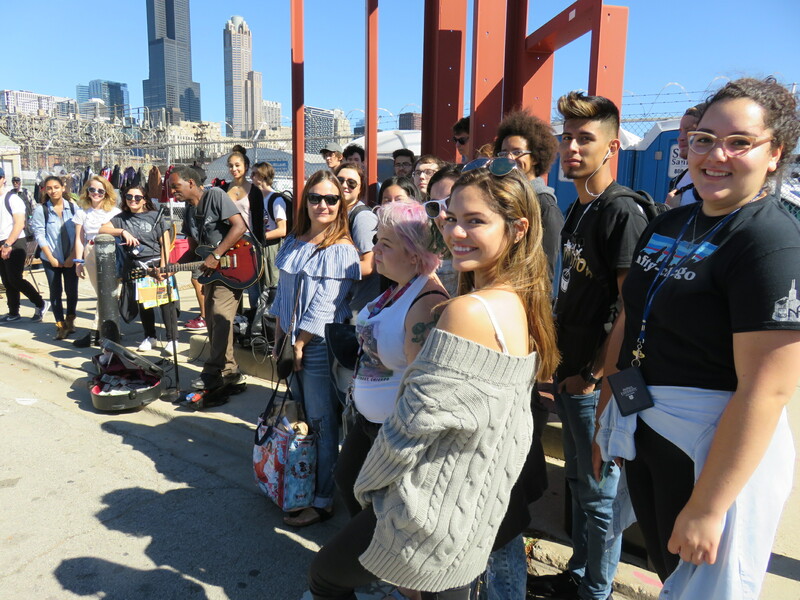 The Discover Chicago program at DePaul University offers many Chicago-themed courses designed to introduce students to the city’s history, important institutions, and current issues. Maxwell Street Foundation board member and DePaul professor, Dr. Janelle Walker, introduced a service aspect of the “Documenting Maxwell Street & Pilsen” course to engage her students in a direct exploration of Maxwell Street, Pilsen and some other parts of our great city, together. Now in its second year, this collaborative part of the course pairs the students with the Maxwell Street Foundation, a non-profit organization working to preserve the history of Chicago’s Maxwell Street Market and neighborhood, and to advance the lessons of Maxwell Street to inform the future. The archiving project begins with readings, a walking tour of Maxwell Street, class time, and a film about Maxwell Street, coupled with a visit to the Chicago History Museum to learn the importance of archiving and preserving historical archives and artifacts, and a visit to the New Maxwell Street Market. The hands-on part of the project occurs in the church basement of St. Francis of Assisi, an historic church in the Maxwell Street neighborhood. The use of this space allows the entire class to spread out adequately for archiving, and to do this work right in the spot where so much of what they are reading about actually happened. Students archive the paper media collections of the Maxwell Street Foundation, starting with boxes of press clippings from as early as the 1960s through to the struggle to save the Market in the 1990’s and its aftermath. Students read the pieces and fill out forms to catalogue the clippings, and the valuable papers are placed in archival folders and boxes. This archiving project will help the MSF use its collections for research, display, presentation, and educational purposes. Students also write a 2-page reflection paper about their experience archiving for the Maxwell Street Foundation. To date, approximately 800 published press articles have been identified, categorized and reorganized in the ongoing project. All images published by the Maxwell Street Foundation within this website are copyright of the artist and are for educational, personal, and/or noncommercial use only. For any other use, please contact gro.n1555716039oitad1555716039nuoft1555716039eerts1555716039llewx1555716039am@of1555716039ni1555716039.